Carefully score an ‘x’ in the chestnuts. Bake them at 400 for 25 minutes. Remove and let cool. Once cool, peel the chestnuts then grind them until they are the consistency of breadcrumbs. If you buy peeled, already roasted chestnuts, just place these in the blender right out of the package or can. Melt the butter in a saucepan. Add the onion and sauté for a few minutes. 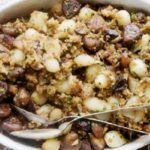 Stir the ground chestnuts into the butter and onion and add the sage, rosemary, almonds and nutmeg. Stir until it comes together as a ball then shove the ball inside the cavity of your bird or bake separately in an oven-proof dish at 375 for 15 minutes. *Apply gentle pressure when purchasing fresh, whole chestnuts. If it feels soft, it’s probably moldy inside.